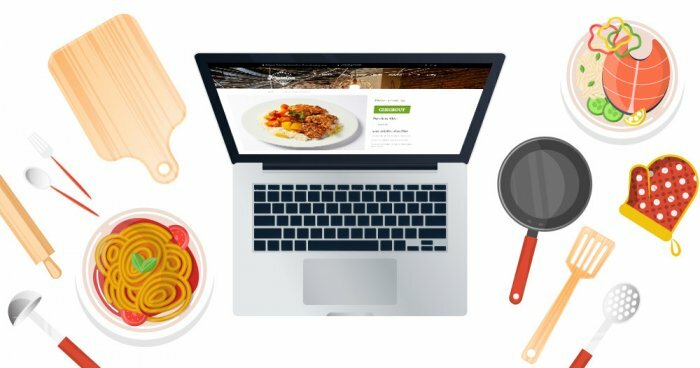 Restaurant websites carry a notorious reputation online. A big chunk of them are clunky, slow or too distracting to give a pleasant and fruitful user experience. Most of the bad quality stems either from a lack of budget, disinterest in the online presence or a total misinterpretation of the online reality by restaurant owners. In either case, this part of the internet needs serious keyboard action from web developers. We are happy to tackle the problem one step at a time. This article aims to help restaurateurs craft and sustain their online image. Stories make the world tick. The same applies to restaurants. The story depicting the journey from the time when the doors first opened to the present day gives personality to restaurants and transfers their offline brand identity to the online world. A story full of interesting characters – i.e. regular visitors, team, owners, etc. – sparks the imagination and encourages people to visit. Think “Cheers”. Restaurants should have a well-thought-out “About us” section where their story is displayed for anyone who wishes to find out. Needless to say, Google places heavy emphasis on “about us” pages, nudging those who have shared their story up to the ranks. 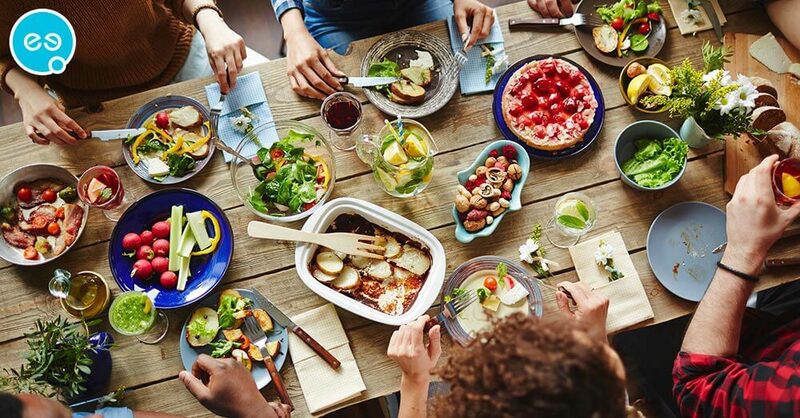 Team – food is not made by brands; it is made by people for people. Regular visitors – any interesting characters who visit the place often or celebrities that have visited. 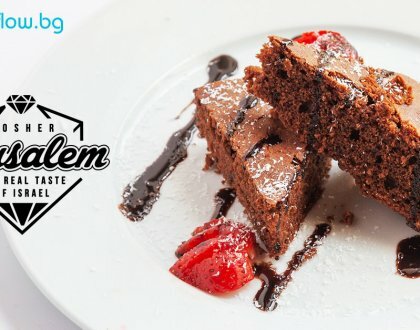 If done correctly this sub page can boost your brand image (most restaurant websites also have a “Testimonials” page where visitors of the restaurant are free to share their opinion). If there’s a place where restaurateurs’ refined instincts for décor fall short, it is the web. Whether due to worn-out attitudes or something else, many restaurateurs think that running a website is the same as running a restaurant. 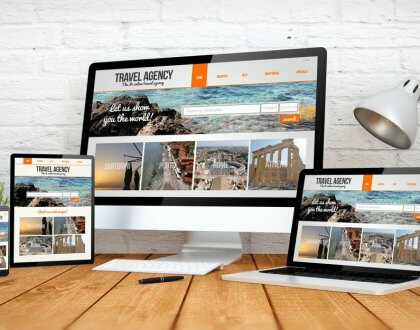 For that reason, they often employ methods they are familiar with and end up stuffing their websites with junk (from a web perspective) that totally puts off visitors. 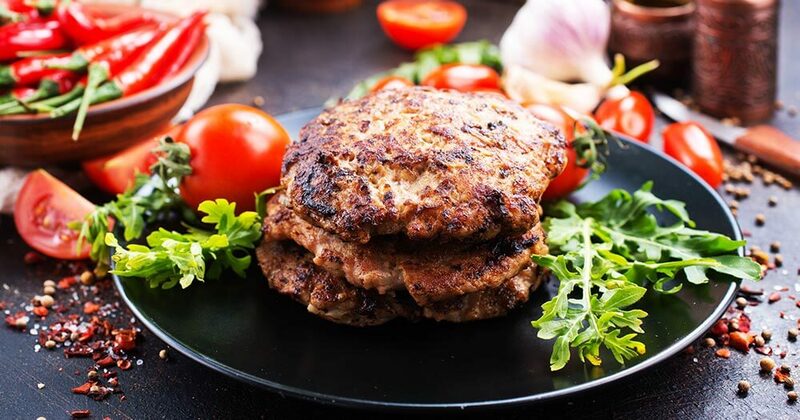 Essentially, a restaurant website aims to give off the same vibe as the restaurant but in a bite-sized format. This is because visitors would spend much less time there than they would at the restaurant itself. Hence, the less clutter and distractions there are, the better. Traffic from mobile devices is on the rise. According to this Hosting Facts study, every year traffic from mobile phones rises between 3-5%. 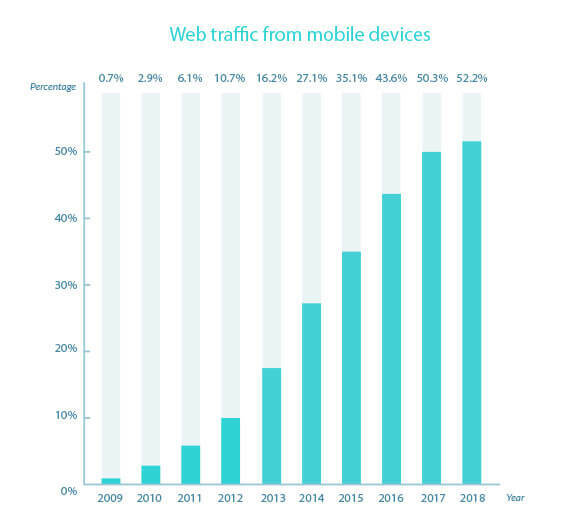 As of 2018, traffic from mobile devices has thumped traffic from other sources. This is why it is crucial to have responsive design enabling optimal visual experience on any mobile device. RWD websites also have an edge over mobile-app-only solutions as they provide a quicker, more efficient service. For more detailed information on how the two differ, please take a peek at our Mobile app or mobile website? 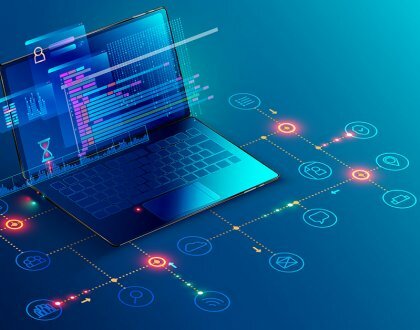 article and see which one is better for your business. You may have stumbled upon the phrase: A picture is worth a thousand words. Well, we are just wired this way. The senses provide a shorter and faster link between the outside and inside worlds than language. We hope we didn’t catch you hungry. If so, please finish the article first. Unless… Your food looks like this. Then see you later! Professional photos of food tickle the taste buds and caress the eye. They are an excellent way to ‘spice up’ the design of your restaurant’s website and to tempt people to visit and try out your dishes. Good lighting, sensitive equipment, and excellent rendering are the key to a satisfying visual product. This is why it is important to rely on a professional photographer – every respectable website development company should have one. * Remember that we’re talking about a website and one of the analogies everyone has to do is “image optimization“. In other words, each image in, must be as “light” as possible and take up the minimal file size. Everything should be simplified to cut the waiting time for the customer to the minimum. A hungry mind hates to wait—and is anxious. Restaurant owners know that the more choices you have, the more anxious you become and use this in their menus to create the desired impact. However, online menus work a bit differently. If you are to cram every dish in a single category, no one will have the patience to browse the mess. The right grouping can do wonders with online menus. Additionally, optimisation of the visual and textual content is a must if your website is to rank well in Google. With some online ordering systems, the process of ordering food—from selection to check-out—takes 5 steps or more. This makes the ordering experience slow and distracting, and as a result, the number of orders decreases. In an ideal world, an online ordering system should be like a rail track. It should lead from point A to point B without any splits in between. Additionally, some chains use interesting add-ons like delivery tracking and Chatbots. These are also excellent methods to save time and money and improve customer service. Optimisation for location (or Local SEO) is crucial for most businesses, especially for restaurants if they want to actually bring their website visitors to the tables. Good local SEO practice requires a number of key elements called NAP + O to be present in the footer of your website (Name, Address, Phone, and Operating Hours). An embedded map is also an important element—not only for your visitors but also for Google. Additionally, you can allocate a partner slot in the footer of the website, which can bring you further benefits – either monetary or in terms of Google ranking. A well-built website should load fast. According to this Blue Corona study, the probability of users bouncing increases drastically with every second the page takes to load. This is why fast loading is crucial for keeping and creating new customers. You can find a more detailed, spear-headed explanation in our How to Improve your Website Speed series. Of course, even having the world’s most expensive website will not guarantee tables will be full every night, but it definitely helps. 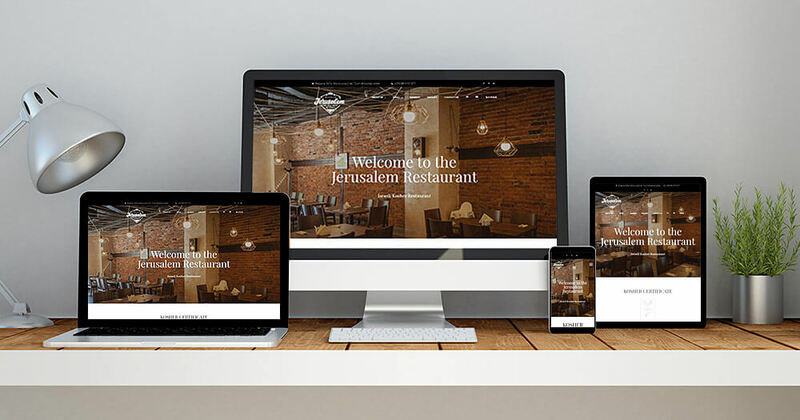 Your website is not only the face of your restaurant on the web but also a way to expand your scope and make more money via online orders and advertisement.